Nestled in the town of Patzcuaro, in the state of Michoacán, Mexico, rests the magical retreat center of Casa Werma. This 5-acre plot of enclosed semi-tropical gardens – replete with overflowing avocado trees and Serrano Chile bushes – is the place where the first Sakyong, the Vidyadhara Chogyam Trungpa Rinpoche decided to plant roots, and establish a place where practitioners from all over the world could go to connect with their basic goodness and deepen their appreciation of simplicity and dignity. It is here that he composed the Werma Sadhana in 1981, surrounded by the relentless din of the neighboring marketplaces, churches, and plazas. And it is to this vivacious confluence of humanity and nature that the Sakyong returned on pilgrimage this January, 2014. 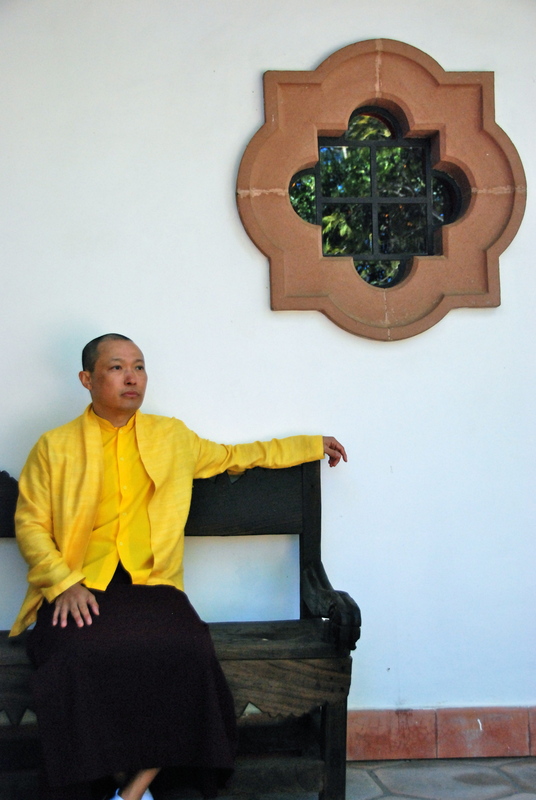 The Sakyong had accompanied his father to Casa Werma as a young man, and many precious memories came alive as he walked the immaculately groomed grounds and toured those same plazas and marketplaces, which remain largely unchanged in the three decades that have elapsed since his first visit. During his daily practice sessions – both in the magnificent sun-drenched shrineroom as well as on the patio under blossoming orange trees – the Sakyong further enriched his vision of enlightened society and his relationship with the dralas of heaven, earth, and humanity. 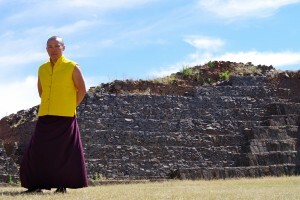 On one particularly poignant morning, he visited the Tzin Tzun Tzan pyramids of the Purepacha – the only civilization that resisted being conquered by the Aztec – which is the actual location where the Vidyadhara performed a lhasang before composing the Werma Sadhana 30 years ago. Our Sakyong spent many hours here, and to everyone’s surprise led the assembled group in Shambhala Meditation. He then performed a long lhasang ceremony. During the warm nights, the Sakyong enjoyed delicious local fare, and strolled amongst the gentle and dignified descendants of that ancient warrior civilization. After only five days, an intimate connection with this tender and enchanted land was re-kindled, and Casa Werma will forever reverberate with the blessings gathered, ignited, and radiated throughout the ten directions. From 1998-2001 I visited Patzcuaro many times as part of a literary retreat I worked for– The Great River Arts Institute. Naturally, each time I visted (several times a year) i often stopped or in some case stayed at Casa Werma. One of my last contacts with the late Karen Lavin was a letter I asked her to present to the Sakyong about preserving the site. 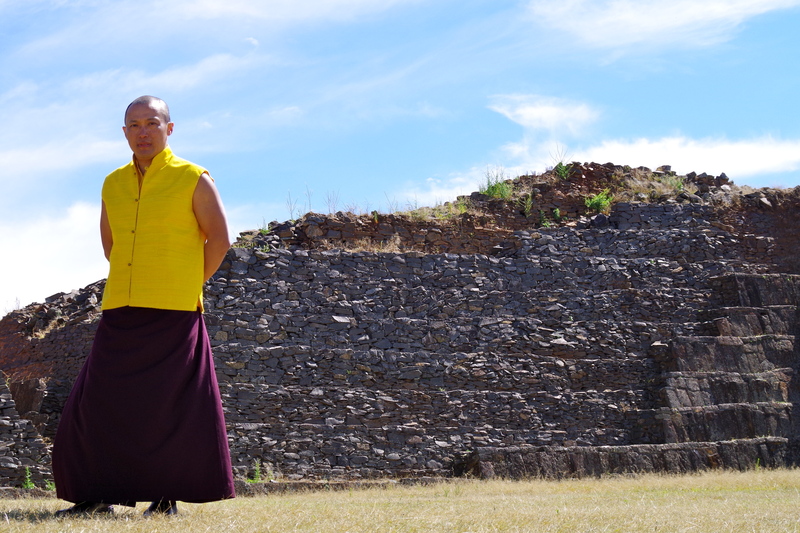 Thank you so much for the story about the pyramids at Tzintzuntzan–a power spot. There is a plaque there that says something like “this is the place where the gods descend to the human realm–” sorry I don’t have the spanish.